Thomas Goodwin (1600–1679), known as ‘the Elder’, was an English Puritan theologian and preacher, and an important leader of religious Independents. He served as chaplain to Oliver Cromwell, and was imposed by Parliament as President of Magdalen College, Oxford in 1650. Christopher Hill places Goodwin in the ‘main stream of Puritan thought’. He studied at Cambridge from August 1613. He was an undergraduate of Christ’s College, Cambridge, graduating with a B.A. in 1616. In 1619 he removed to Catharine Hall, where in 1620 he was elected fellow. In 1625 he was licensed a preacher of the university; and three years afterwards he became lecturer of Trinity Church, successor to John Preston, to the vicarage of which he was presented by the king in 1632. Worried by his bishop, who was a zealous adherent of William Laud, he resigned all his preferments and left the university in 1634; he became a Congregationalist. He lived for some time in London, where 1638 he married the daughter of an alderman. In 1639 he fled to Holland to escape persecution. For some time was pastor of a small congregation of English merchants and refugees at Arnheim. He returned shortly after the inception of the Long Parliament. He ministered for some years to the Independent congregation meeting at Paved Alley Church, Lime Street, in the parish of St Dunstans-in-the-East, and rapidly rose to considerable eminence as a preacher. In 1643 he was chosen a member of the Westminster Assembly, and at once identified himself with the Independent party, generally referred to in contemporary documents as the “dissenting brethren.” He frequently preached by appointment before the Commons, and in January 1650 his talents and learning were rewarded by the House with the presidentship of Magdalen College, Oxford, a post which he held until the Restoration of 1660. He was chaplain to Oliver Cromwell from 1656. He rose into high favour with the Protector, and was one of his intimate advisers, attending him on his death-bed. 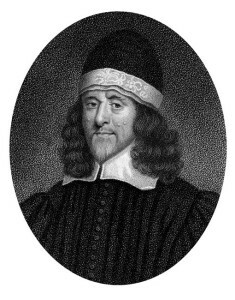 He was also a commissioner for the inventory of the Westminster Assembly, 1650, and for the approbation of preachers, 1653, and together with John Owen drew up an amended Westminster Confession in 1658. From 1660 until his death, he lived in London, and devoted himself exclusively to theological study and to the pastoral charge of the Fetter Lane Independent Church. A Memoir (Biography) of Thomas Goodwin (by Robert Halley) – pdf, 41 pp. A Memoir of Thomas Goodwin (by his son) – pdf, 26 pp. A sermon on Ephesians 1:1–2 – pdf, 18 pp. A sermon on Ephesians 1:3 – pdf, 18 pp. A sermon on Ephesians 1:3 – pdf, 9 pp. A sermon on Ephesians 1:3 – pdf, 15 pp. All three sermons on Ephesians 1:3 – pdf, 42 pp. A sermon on Ephesians 1:4–5 – pdf, 18 pp. A sermon on Ephesians 1:5–6 – pdf, 20 pp. A sermon on Ephesians 1:5–6 – pdf, 14 pp. Both sermons on Ephesians 1:5–6 – pdf, 34 pp. A sermon on Ephesians 1:7 – pdf, 10 pp. A sermon on Ephesians 1:8–9 – pdf, 21 pp. A sermon on Ephesians 1:10 – pdf, 22 pp. A sermon on Ephesians 1:10 – pdf, 14 pp. All three sermons on Ephesians 1:10 – pdf, 58 pp. A sermon on Ephesians 1:11–14 – pdf, 9 pp. A sermon on Ephesians 1:11–14 – pdf, 12 pp. Both sermons on Ephesians 1:11–14 – pdf, 21 pp. A sermon on Ephesians 1:13–14 – pdf, 13 pp. Both sermons on Ephesians 1:13–14 – pdf, 26 pp. A sermon on Ephesians 1:14 – pdf, 15 pp. A sermon on Ephesians 1:15–16 – pdf, 14 pp. A sermon on Ephesians 1:17 – pdf, 14 pp. A sermon on Ephesians 1:18 – pdf, 13 pp. A sermon on Ephesians 1:18 – pdf, 14 pp. Both sermons on Ephesians 1:18 – pdf, 27 pp. A sermon on Ephesians 1:19–20 – pdf, 16 pp. A sermon on Ephesians 1:19–20 – pdf, 15 pp. A sermon on Ephesians 1:19–20 – pdf, 14 pp. A sermon on Ephesians 1:19–20 – pdf, 20 pp. All eight sermons on Ephesians 1:19–20 – pdf, 127 pp. A sermon on Ephesians 1:20 – pdf, 16 pp. A sermon on Ephesians 1:20–21 – pdf, 16 pp. A sermon on Ephesians 1:21–22 – pdf, 17 pp. A sermon on Ephesians 1:21–22 – pdf, 16 pp. Both sermons on Ephesians 1:21–22 – pdf, 33 pp. A sermon on Ephesians 1:21–23 – pdf, 19 pp. A sermon on Ephesians 1:22–23 – pdf, 15 pp. A sermon on Ephesians 1:22–23 – pdf, 16 pp. Both sermons on Ephesians 1:22–23 – pdf, 31 pp. An Exposition of the Second Chapter of the Epistle to the Ephesians – pdf, 355 pp. A sermon on Ephesians 2:1–10 – pdf, 15 pp. A sermon on Ephesians 2:1–2 – pdf, 17 pp. A sermon on Ephesians 2:2 – pdf, 16 pp. A sermon on Ephesians 2:2 – pdf, 21 pp. Both sermons on Ephesians 2:2 – pdf, 37 pp. A sermon on Ephesians 2:3 – pdf, 15 pp. A sermon on Ephesians 2:3 – pdf, 12 pp. A sermon on Ephesians 2:3 – pdf, 14 pp. All five sermons on Ephesians 2:3 – pdf, 70 pp. A sermon on Ephesians 2:4–6 – pdf, 13 pp. A sermon on Ephesians 2:4–6 – pdf, 17 pp. A sermon on Ephesians 2:4–6 – pdf, 11 pp. A sermon on Ephesians 2:4–6 – pdf, 15 pp. All four sermons on Ephesians 2:4–6 – pdf, 56 pp. A sermon on Ephesians 2:5–6 – pdf, 18 pp. A sermon on Ephesians 2:5 – pdf, 19 pp. A sermon on Ephesians 2:6 – pdf, 15 pp. A sermon on Ephesians 2:6 – pdf, 18 pp. Both sermons on Ephesians 2:6 – pdf, 33 pp. A sermon on Ephesians 2:7 – pdf, 15 pp. A sermon on Ephesians 2:7 – pdf, 14 pp. A sermon on Ephesians 2:7 – pdf, 16 pp. All three sermons on Ephesians 2:7 – pdf, 45 pp. A sermon on Ephesians 2:8–10 – pdf, 14 pp. A sermon on Ephesians 2:8–10 – pdf, 16 pp. A sermon on Ephesians 2:8–10 – pdf, 7 pp. All three sermons on Ephesians 2:8–10 – pdf, 37 pp. A sermon on Ephesians 2:11 – pdf, 8 pp. An Exposition of Various Portions of the Epistle to the Ephesians – pdf, 67 pp. A sermon on Ephesians 2:14–16 – pdf, 12 pp. A sermon on Ephesians 2:14–16 – pdf, 18 pp. Both sermons on Ephesians 2:14–16 – pdf, 30 pp. A sermon on Ephesians 3:17 – pdf, 16 pp. A sermon on Ephesians 3:16–21 – pdf, 8 pp. A sermon on Ephesians 5:30–32 – pdf, 11 pp. Patience and Its Perfect Work Under Sore and Sudden Trials (James 1:1–5) – pdf, 41 pp. An Exposition of the Revelation – pdf, 206 pp. A Brief History of the Kingdom of Christ, Extracted Out of the Book of Revelation – pdf, 12 pp. A Discourse of Christ’s Reward (Revelation 5:12) – pdf, 8 pp. Certain Select Cases Resolved – pdf, 271 pp. A Child of Light Walking in Darkness (Isaiah 50:10-11) – pdf, 120 pp. The Return of Prayers (Psalm 85:8) – pdf, 75 pp. A Treatise Wherein ‘How to Discern God’s Answers to Our Prayers’ is Briefly Resolved. The Trial of a Christian’s Growth in Mortification, or Purging Out Corruption, and Vivification, or Bringing Forth More Fruit (John 15:1-2) – pdf, 75 pp. The Vanity of Thoughts Discovered, With Their Danger and Cure (Jeremiah 4:14) – pdf, 21 pp. Christ Set Forth (Romans 8:34) – pdf, 91 pp. The Heart of Christ in Heaven Towards Sinners on Earth (Hebrews 4:15) – pdf, 58 pp. Aggravation of Sin – pdf, 54 pp. Aggravation of Sin (Romans 7:13) – pdf, 10 pp. Aggravations of Sinning Against Knowledge (Romans 1:21) – pdf, 25 pp. Aggravations of Sinning Against Mercy (Romans 2:4-5) – pdf, 17 pp. Encouragements to Faith (John 6:37-38) – pdf, 20 pp. The Glory of the Gospel (Colossians 1:26-27) – pdf, 122 pp. The Knowledge of God the Father and His Son Jesus Christ (1 Corinthians 8:6) – pdf, 222 pp. Christ the Mediator (2 Corinthians 5:18-19, Hebrews 2:16-17, Hebrews 10:4-10, 1 Timothy 2:6, Hebrews 4:14-16) – pdf, 436 pp. A Discourse of the Supereminence of Christ Above Moses (Hebrews 12:25-29, Haggai 2:5-9) – pdf, 25 pp. A Discourse of the Reconciliation of All the People of God (Ephesians 2:14-16) – pdf, 15 pp. The One Sacrifice (Hebrews 10:4-7) – pdf, 19 pp. Reconciliation by the Blood of Christ (Colossians 1:20) – pdf, 22 pp. Three sermons on Hebrews 1:1-2 – pdf, 25 pp. Of the Creatures, and the Condition of Their State by Creation – pdf, 128 pp. Of Gospel Holiness in the Heart and Life – pdf, 207 pp. Of the Blessed State of Glory Which the Saints Possess After Death – pdf, 134 pp. Three Several Ages of Christians in Faith and Obedience (1 John 2:13-14) – pdf, 45 pp. Man’s Restoration by Grace (Colossians 2:2; 1 John 5:6-8) – pdf, 23 pp. On Repentance (Zephaniah 2:1-3) – pdf, 34 pp. A Discourse of Election – pdf, 498 pp. Romans 11:1-7; Isaiah 54:7-11; 1 Peter 3:19-21; 1 Corinthians 8:6; John 17:20-26; 1 Peter 5:10; Philippians 3:12-14; 1 Corinthians 7:14. A Discourse of Thankfulness, Which is Due to God for His Benefits and Blessings. (Psalm 100:4) – pdf, 16 pp. The Constitution, Right Order, and Government of the Churches of Christ – pdf, 483 pp. The Government and Discipline of the Churches of Christ – pdf, 41 pp. Two Letters Concerning a Church Covenant – pdf, 15 pp. Two Letters Concerning Church Government – pdf, 6 pp. An Immediate State of Glory for the Spirits of Just Men, Upon Dissolution, Demonstrated (2 Corinthians 5:5) – pdf, 29 pp. The Great Interest of States and Kingdoms (Psalm 105:14-15) – pdf, 29 pp. A Glimpse of Zion’s Glory; or, The Church’s Beauty Specified (Revelation 19:6) – pdf, 19 pp. The World to Come; or, The Kingdom of Christ Asserted (Ephesians 1:21-22) – pdf, 18 pp. Zerubbabel’s Encouragement to Finish the Temple (Zechariah 4:6-9) – pdf, 26 pp. Short, Holy, and Profitable Sayings of the Reverend Divine, Doctor Thomas Goodwin – pdf, 2 pp. Sermon notes on Romans 1:21 – pdf, 11 pp. Sermon notes on Psalm 14:1 – pdf, 6 pp. Sermon notes on 2 Corinthians 10:4-5 – pdf, 2 pp. Want to discuss something pertaining to Thomas Goodwin? Leave a public comment below (subject to moderation), or send a private message to the webmaster.